The Diva's Weekly Challenge #233: "New Official Tangle - Zenith"
Zenith is a marvellous border type tangle that can stay slim or blossom outwards. Combining curved and straight lines it flows with a happy vibe. Talking about happy vibes, Paul and I are packed and ready for our flight to Europe where we will experience a train travelling adventure. I am also excited about meeting Mariët in Amsterdam. 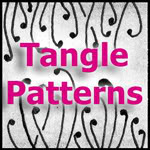 We have been following each others blogs since we 1st started tangling so it will be a wonderful treat to meet up and speak our common language - Zentangle. 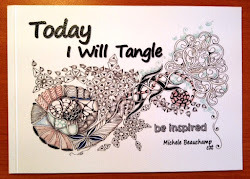 More excitement is that I will be joining Beate Winkler in Hamburg for a Zentangle workshop!! How special is that? When you are addicted to Zentangle like me, there are many side effects, like making delightful friendships from all over the world, I am so very fortunate and truly appreciate this amazing time of my life. Thank you for visiting, I will be back on line after the 10th of October! Beautiful work, I especially love your first tile! Nice red touch. Enjoy your trip, we look forward to hearing about this wonderful adventure. Travel safe. Great tiles. Like the simplicity of the ATC tile. 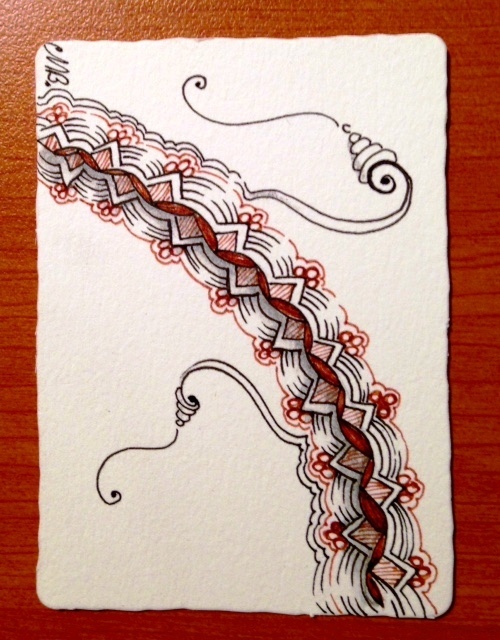 Like your combination of tangles in the second one. Enjoy your time away. Enjoy your trip! Will miss your voice and tangles in the meantime! Love your tiles and tangle combos! Have a GREAT time on your trip, and visiting Bea! Countdown to my trip to see her is on, too! :) Peace. I love both of these and the restrained use of colour to enhance the patterns. Come to England while you're in Europe - I'll make you tea and scones. Have a great trip and I look forward to reading all about it when you get back. Have a great trip. If in England you are welcome to come to Dorset. Your tiles are so lovely! I wish you a graet time in Europe (where I live) ! I am also in vacation this week at the North Sea and I have two of your books as an inspiration for tangling with me... Is that great?! 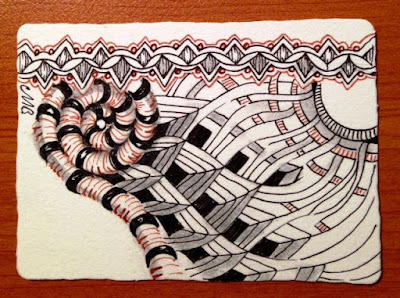 I love both of your ATCs, but I just can't get over how you morphed from one tangle to another in the second one! Amazing! Have a fabulous trip and be sure to fill us all in when you return! I can't agree with you more Michelle! This Zentangle family is really the best! Love your tiles, as always. Enjoy your trip! Great tiles and have a wonderful trip! So you did the challence between packing, and as always a wonderful job with Zenith..
You achieved so much depth with Zenith! I'm truly inspired. I love the way Zinger is escaping from Zenith!!! Europe by train must be a great experience and I wish you and Paul a fantastic time. Nice to meet Mariët and Beate too!!! Love it so much!! In the first using zinger is very clever! Great ATC's. I agree totaly with you, since I did the CZT seminar in october 2013 I Met a lot of nice people and friends all over the world. Unfortunatly I cann't make it to Hamburg, because of a fundraising event for Duchenne distrofy. I hope you have a marvelous time with Beate and lots of laughter. And of course great time with your trip to Europe! Oh Didisch it would have been a treat to meet you too! Hope you have a wonderful time in Europe. Enjoy and give a big hug to your lovely husband Paul. I hope you enjoyed Oktoberfest and wish you and your husband Paul a wonderful time in Europe! Hope to read from you here soon!